After more than three thousand years of ceaseless human progress, Western Civilization reportedly died this week from injuries to its most vital of organs: Literature. According to highly-placed sources in the usual academic and knee-jerk communities, "Twitterature," a just-published book by two 19-year-old U Chicago undergrads, Alexander Aciman and Emmett Rensin, has, without provocation, kicked all that is sacred about the written word in its proverbial scrotum. The damage to Literature -- a hallmark of mankind's capacity to imagine and self-reflect, and to preserve both for future generations -- led to a system-wide breakdown. The modern world lost its most basic intellectual bearings and soon ceased to function. Western Civ's death came as a surprise to many, including those who profit from predicting its demise and men wearing warning signs on street corners in New Yorker cartoons. But why now? Our vast literary canon has bravely endured despite centuries of relentless abuse by court jesters, wandering minstrels, and mimes, and lately from television, the internets, a separate Advice bestseller list in the New York Times, and novels that blamed the world's ills on secret Catholic plots to protect the Church -- not to mention the substitution in schools of self-esteem courses for critical thinking skills. According to inside sources, the final blow came without warning on December 29th, 2009, when Penguin Books -- until then one of Literature's foremost protectors through its preservation and promotion of the Classics - released "Twitterature: The World's Greatest Works in 20 Tweets or Less" in the United States and Canada. The catastrophe was understandably unexpected since a slightly shorter version (thanks to weaker legal protection for parody) had been published without incident in England, the Commonwealth, and beyond, in early November 2009. At that time, Twitterature sold briskly off the shelves and found a welcome niche in libraries and Christmas stockings worldwide. Comely young women with provocative accents tweeted their approval and LOLs online. The authors planned lengthy book tours to foreign lands. All seemed well in the world. Yet in the still of bookshelves and nightstands everywhere, this hilariously unassuming literary parody quietly began to chip away at the foundations of great art and moral uprightness, all the while biding its time for a chance to take root in the fertile and chronically under-securitized American and Canadian minds, and spread like a retrovirus through civilization's body. But how did it happen? The authors, who claim to have read all 81 of the great works they limed, lovingly re-imagined everything from Homer, Shakespeare, and Joyce to Tolstoy, Austen and Rowling in the Twitter haiku. Each great work was narrated by its protagonist in 20-or-fewer-tweet narratives. Think of Pip or Scout or Humbert Humbert with iPhones and Twitter accounts. -- Among Hamlet's tweeted laments: "WTF IS POLONIOUS DOING BEHIND THE CURTAIN???" -- Dorian Gray imagines, "Sadly my beauty will one day cease. Perhaps I could preserve it by having the doc pull and staple the skin of my face? No. A silly thought." --Emma writes, "Isn't it funny how I'm always thinking about things I seem not to care about, people I don't love, and marriages I don't want to have?" --Gulliver laments, "I don't mean to boast; I'm not a terribly tall man. But these people of Lilliput are the size of a child's johnson. Still, they have captured me." Although, based solely on the book deal announcement, some suggested with absolute certainty that Shakespeare and his ilk were surely rolling over in their respective graves, "Twitterature" remained highly anticipated. And then it happened. Upon "Twitterature"'s North American release witnesses reported widespread rending and wailing as the slim, 208-page "Twitterature" consumed entire 'Classics' sections in one bite, while mobs of young people all hopped up on internet culture and ADD medication threw heavy copies of "War and Peace," "The Inferno," and "Great Expectations" into its grand maw. Then as suddenly as the maelstrom began, it ended when the rioters forgot what they were doing and wandered off in search of other entertainment, to tweet about what they might have for lunch, or to update their Facebook pages. Who, before its initial release, could have imagined "Twitterature"'s apocalyptic impact? Almost all reviews were positive. "Read Twitter versions of The Odyssey, Anna Karenina, Great Expectations and other great works - and let the laughter begin," said the Miami Herald. The Chicago Tribune raved: "Lampooning the routine narcissism of social media, Alexander Aciman and Emmett Rensin deftly mash historic literature into the tiny, weird box of modern-day communication." The New York Times called Twitterature "a little higher up the brow," and the GalleyCat website named the book one of the top ten publishing stories of June 2009. The New Yorker's Book Bench, online, said: "When I checked out the biographies of the guys who are doing it, I couldn't help thinking it might be really good." Although some rumors circulated that the book was in some way a new version of Cliff Notes, designed to lull lazy high school readers even further into complacency and ignorance, Reuters chimed in that, "These are not their parents' Cliff Notes. The goal is laughs and gasps, not a study aid for students trying to comprehend Milton's 'Paradise Lost,' Franz Kafka's 'The Metamorphosis,' or William Shakespeare's plays." 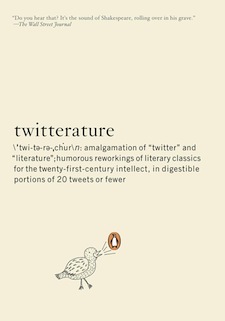 The UK's Guardian even called "Twitterature" a "great aid in the digestion of literature." And now, "Twitterature" seems to have bitten the literate hand that feeds. Oddly enough, to the casual observer and the naked eye, little seems different in the world as 2010 dawns: life goes on, Glenn Beck is still on the air, the globe is warm one day and cold the other -- but the damage has surely been done. The 24-hour cable news media has declared Western Civilization's end-times arrived, and when even Democratic and GOP strategists agree, it must therefore be true. Eastern Civilization, however, continues as before, declining to comment on its sibling's sudden passing, other than to say, "We never liked each other much anyway. When reached for their reaction, those in charge at Penguin simply shook their heads and shrugged. "It seemed like a great idea at the time," said John Siciliano, who edited the US version of Twitterature. "I mean, the book is really funny, and since a lot of the humor is better if the reader is familiar with the works being satirized -- I don't know, I thought it was going to add some mirth to Western Civilization, maybe ruffle it a bit, but not this....I never imagined this." Penguin's Yen Cheong and Joe Pickering who did the US and UK public relations respectively, said, "So what? There's no such thing as bad publicity." Perhaps most shocking, Twitterature co-authors Emmett Rensin and Alex Aciman deny any responsibility for the death of words or Western Civilization. 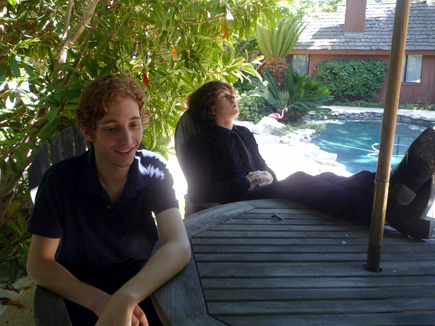 "We were freshman roommates." said Rensin. "Chicago winters are quite cold. We sat around one frigid night talking about how Twitter and literature are the byproducts of very long intellectual traditions, which obviously stem from the insatiable human urge to create and to record both the literally true and the fictionally constructed, and we got the idea from the pun resulting from combining the two words. All humor begins with the pun. Then we just sat in our room and yelled at each other until something funny happened." "It was almost like a tennis match," said Aciman. "We opened a book and said, 'OK. How does this story go? He's angry. He's sitting on a bench. How do we make that funny?' The jokes began to fly and plot points gave birth to absurdity. It was a constant back-and-forth. One would start a line and the other would finish it." Seems like fun. And yet Western Civilization is still dead. "It's a humor book," the authors insisted. "We just wanted to make the children laugh. That's all -- just make people laugh. Twitterature authors/civilization killers (l to r), Alexander Aciman & Emmett Rensin. The cultural upheaval notwithstanding, it is now safe to buy the book again. Copies of "Twitterature" are still widely available through the usual online vendors, and at all bookstores. There is also a website and a photograph of the authors, in case you see them on the street, and want to give them a piece of your mind, a hug, or your phone number, or a job. Services for Western Civilization and Literature will be held Friday at the Chicago Public Library, which will then be closed permanently.